Chances are you’ve never heard how difficult polyethylene canoes are to fix; this isn’t the kind of thing that comes up until long after you’ve plunked down your $1,000 or so on a boat. Polyethylene–used in canoes like the popular Old Town Discovery series, as well as in kayaks and even newer driftboats–has lots of advantages: it is flexible, relatively cheap, and moldable into more shapes than fiberglass or kevlar. It has become the plastic of choice for most unpowered boats. Historically, polyethylene boats have had about a 20-25 year lifespan. After that time, they dry out and cracks “spiderweb” across them. Most canoes are of three-layer construction, so typically only the outside layer will begin to actually flake away. Still, this is a major safety hazard should you hit a rock. Meanwhile, out-and-out splits in the hull can be fixed by plastic welding, but it isn’t cheap and you have to have a kayak shop handle the repair. With a fiberglass canoe or drift boat, you can simply patch over any cracks with more fiberglass and epoxy. However, polyurethane-based epoxies (as most are) have a hard time adhering to polyethylene. Until recently, there was no truly reliable glue on the market for bonding a patch to a polyethylene boat. 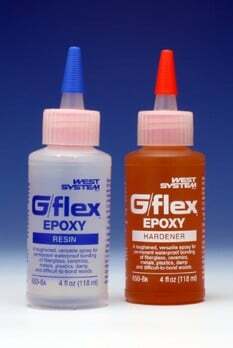 Thankfully, West System’s new G/Flex epoxy has solved the problem. I recently needed to patch “spider-webbing” across the bottom of my 16’9″ Old Town Discovery canoe. My boat had Kevlar skid guards, which had been applied when the boat was new with old-school polyurethane epoxy (which is possible only if the boat is fairly new, and has been thoroughly cleaned and flame-tempered first). After Old Towne’s patch kit utterly failed, I searched around and discovered G/Flex. Because G/Flex is very viscous (and very expensive), I only used it to coat the boat surface over the cracks. You have to clean the polyethylene thoroughly with acetone, then “blush” the surface by wafting a propane torch across it until it fades slightly in color. With help from a friend, I then applied a layer of G/Flex (to bond to the boat). Meanwhile, I mixed more traditional marine epoxy and used it to soak out Kevlar felt, which I applied over the G/Flex (because G/Flex itself will stick to about anything) to extend my existing skid guards and cover the spiderwebbed section. Finally, I dyed a cosmetic layer of marine epoxy jet black and masked and painted both old and new skid plates. This technique would work for any polyethylene boat, including the new Hog Island or Boulder Boatworks driftboats. While it might not be as pretty, it beats a trip to the factory mid-season. Further, for a 25-year-old canoe like mine, it’s nice to have any option to get the old boat back on the water. Have tips for patching polyethylene boats? Share them in the Comments section!